After the game changing experience of wedding dress shopping at Phillipa Lepley, and all of your wonderful words of encouragement, and knew I’d have to go back. And with the sand slipping through the wedding hourglass at a terrifying pace, there was no time to lose! I was ready to commit. …to go for something completely different! Together Phillipa and I went through everything I loved from all of her dresses, and started to design something completely new. As I rattled off ideas, she sketched away. We talked inspirations, styles, shapes, corsets, necklines and trains. All guided by Phillipa’s years of experience dressing brides and her unparalleled eye for detail. Each sketch appearing within seconds, as the dresses poured from her imagination onto the paper. A truly magical way to while away an afternoon. We finally settled on a design, which I’m keeping secret until the big day, and I asked to keep the sketch so I can have it framed in my office (after the wedding of course, wouldn’t want the groom peeking!). Once the design was decided upon, Phillipa talked us through just what goes into making a couture wedding gown. All of her pieces are made by hand in London. All of the lace drawn out and planned before being stitched into life. Every inch of every bride measured, and the pattern cut just for her. Every seam, every fold, every bead is placed exactly where it should be, by hand. The process takes months and months, so it will be a while before I get to see our creation. In the meantime I snuck into the workshop to see where she’ll be brought into existence. Moodboards cover the walls, pictures of past, present and future creations, layered with silks, sequins and embroideries. The effect is quite something, I could happily sit and gaze at them all day. In the centre of each floor there’s a cluster of gowns, in various states of completion. 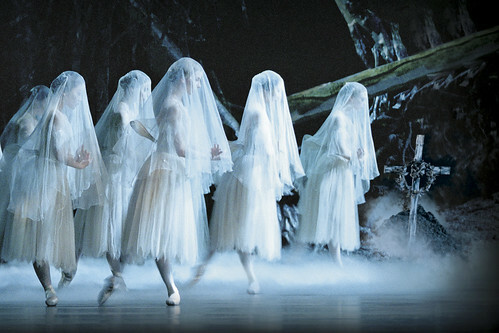 It almost feels as though they’re floating there, like my favourite scene, from my favourite ballet, Giselle. …upstairs, Yoko is carefully sewing the handmade lace onto dresses, and finishing them with incredible care and precision. In fact this floor is quite the hive of activity, with dresses being pinned, sewed and coaxed into life. Ready for their big days! See more of the lace-making here. All overseen by Phillipa, who keeps a keen eye on every little detail. Though the real boss is much harder to please. Bobo runs a very tight ship. Having designed my dream dress with my dream designer, met all of the craftsmen and women who will create her, and seen the true art of couture dressmaking in person, I left on cloud nine. Utterly content that the best in the business are on the case. The very best Christmas pressie I could have asked for. I suppose now I ought to start thinking about shoes! But that can wait ’til next year, time for a break and a few mince pies I think. I’ll be snapping away through all of my fittings and the rest of the design process, so I can share it all with you after the wedding. It’ll feel just like having you there with me, which is something I really do treasure after all your years of support. I still find it so funny to think that while you shared in all my heartache and boy trouble over the years, soon you’ll be with me on my wedding day. It’s been quite the ride!